Upma recipe with step by step photos. Read the detailed upma recipe below. You can add some other vegetables like corn or capsicum too. You can also increase or decrease the quantity of vegetables as per your taste. Dry roast rava for about 2-3 minutes on low flame. Keep on stirring it continuously. Add Peanuts. Let it become a little dark in colour. Then add Chana dal. When it starts changing its colour then add Urad dal. When chana dal and urad dal start giving nice aroma and become golden brown in colour then add Mustard seeds. Let them splutter. Immediately add grated ginger and finely chopped green chillies. Sauté it for few seconds. Now add finely chopped onions. Add turmeric powder. This step is optional. I have not used it in this recipe. Add chopped vegetables. I have used carrots, beans and green peas. You can add other vegetables too. Saute them for about 2 minutes. Lastly add tomatoes. Its time to add water. Ratio of rava and water is 1:3. For one cup of rava, add 3 cups of water. Meanwhile heat ghee in tadka pan. Add cashews. Roast it in ghee until it turns golden brown. Add this to your upma. Now its time to add rava. Add it slowly. Keep on stirring it continuously while adding rava. Ensure that there are no lumps. You will see that all the water is absorbed after adding rava. Cover it and let it cook on low flame for 2-3 minutes. 3. Add peanuts. Saute it on low flame. 4. As soon as peanuts start changing their colour, add chana dal. 5. 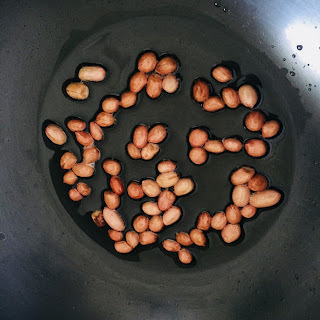 When chana dal also becomes slightly golden brown add urad dal. 6. Add mustard seeds. Let them splutter. 8. Add grated ginger and finely chopped green chillies. 9. Add finely chopped onions. 10. Add chopped vegetables. I have added carrots, beans and peas. You can add other vegetables as well. 13. Add water. Ratio of rava and water is 1:3. So, for one cup of rava add three cups of water. Let it boil. 14. Heat ghee in a tadka pan. 15. Add cashews. Let them become golden brown in colour. 16. Add this to upma. 17. Add rava slowly. Keep on stirring continuously while adding rava. Make sure that there are no lumps. 18. Cover it and let it cook for about 2-3 minutes on low flame. Choose the finest variety of rava. The ratio of rava and water is 1:3 when you are using fine rava. You will have to add more water if rava is not fine. Add rava slowly and in small quantity. Keep stirring continuously while adding rava to ensure that there are no lumps. 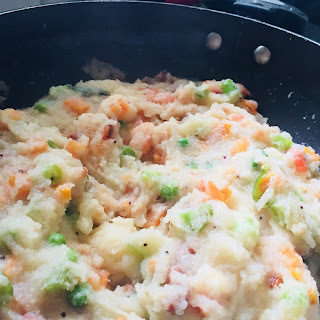 I hope this post will help you to get perfect upma every single time. Don't forget to share your experience with me in the comment section below.